Pictured: (From left to right) Yvonne Johnson, Donor; Jenna Araujo, Hiawatha School District Art Teacher; Stephanie Hill,Kingston Elementary School Principal; Staci Hale,Kingston Elementary School P.E. 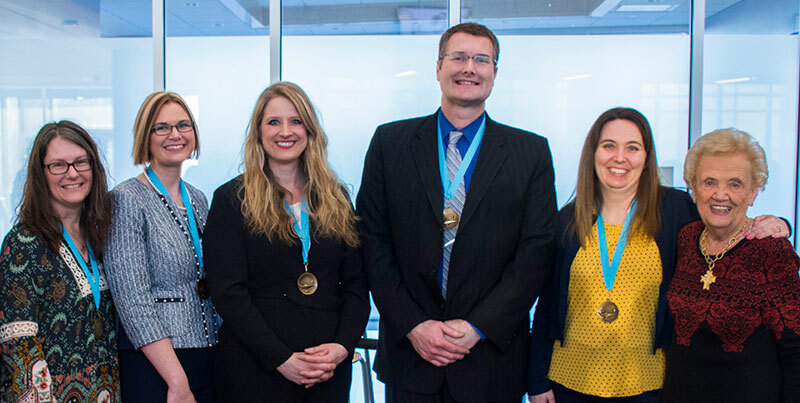 Teacher; Jennifer Butler,Genoa Kingston High School Principal’s Secretary; Steven Lundin, DeKalb High School Band Director; Amanda Christensen, DeKalb County Regional Office of Education Regional Superintendent; and Becky Zantout, DeKalb County Community Foundation Grants Manager. 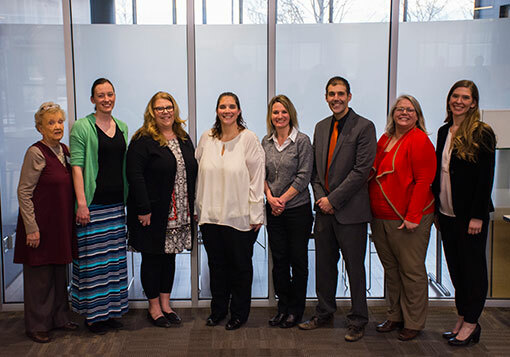 The DeKalb County Community Foundation and DeKalb County Regional Office of Education recognized five educators from Genoa-Kingston, Hiawatha, and DeKalb school districts during the annual Excellence in Education Awards reception at Kishwaukee College. Recipients were chosen by an independent selection committee out of nineteen nominees from six school districts in DeKalb County. Established in 1999 by retired Sycamore elementary school teacher Yvonne Johnson, the Excellence in Education Awards recognize teachers, administrators, and support staff who have inspired a love of learning in students and play an active role in their schools and communities in DeKalb County. Support for the awards celebration comes through an endowed fund created by Yvonne at the DeKalb County Community Foundation. Winners receive a check for $1,000, an engraved clock, and personalized medallion. Jennifer (School Support Staff, Genoa-Kingston District 424) grew up in Carpentersville and first worked at Platt Hill Nursery. 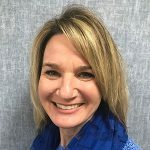 After moving, she was hired at Genoa-Kingston Middle School and is currently the principal’s secretary at Genoa-Kingston High School. Mrs. Butler’s responsibilities include registration, PowerSchool login, graduation, yearbook sales, visitor check-in, and building accounting as well as coordinating the High School Hall of Fame. Mrs. Butler has been an active volunteer for several sports teams and community events including being a “Team Mom”, walking in the Alzheimer’s walk, starting the Card Board Boat Regatta, and serving as a Trustee for the Village of Kingston for 10 years. Staci (PK-5 Teacher, Genoa-Kingston District 424) spent time as a child playing school and teaching her dolls and stuffed animals. She went on to graduate from NIU with a B.S. in Physical Education and a M.S. in Kinesiology and Physical Education. 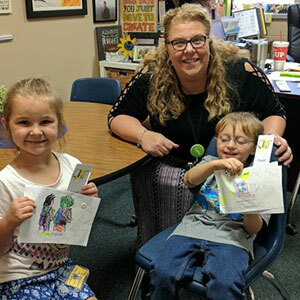 Mrs. Hale taught first in Frankfort, Illinois before coming to Kingston Elementary School where she has taught for 13 years. She has served on several school committees including PBIS and the School Improvement Team and the district Wellness Committee. 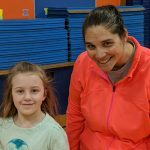 She has volunteered in the Winnebago community as a park district coach and secretary of the Preschool Board, and locally for the American Heart Association and the Juvenile Diabetes Research Foundation. 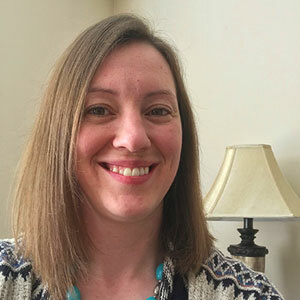 Jenna (6-8 Teacher, Hiawatha District 426) graduated from Burlington Central High School before attending Loyola University Chicago where she earned her B.F.A. in Visual Communications and then Judson University where she earned her K-12 teaching certificate in Art. She taught first at her alma mater, Burlington Central, before teaching at Hiawatha for the last past 6 years. Mrs. Araujo has coached volleyball and basketball and supervised Art Club. She serves on the School Improvement Team and in the Hiawatha Classroom Teachers Association. As a volunteer, she is responsible for the re-creation of the Hiawatha Hawk logo and served her community following the Fairdale tornado. 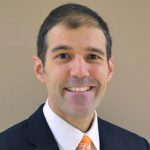 Steven (9-12 Teacher, DeKalb District 428) holds degrees from The Crane School of Music at SUNY Potsdam and NIU. He has taught for 14 years with 11 of them being in DeKalb. He teaches marching band, jazz ensemble, lab jazz, percussion ensemble and steel band and serves as the Fine Arts Area Coordinator for DeKalb High School. Mr. Lundin brought the Illinois Music Education’s District VIII Festival to DeKalb in 2011 and it continues to attract over 5000 guests each year where 1000 student musicians perform. He has also been instrumental in the organization and coordination of the Arts Midwest World Fest, the Transformation Through Rhythm Concert, and the Jazz at the Egyptian event. Stefanie (Administrator, Genoa-Kingston District 424) graduated from Sycamore High School and then attended NIU where she majored in Elementary Education. She has earned a Master’s degree in Curriculum and Leadership and a Certificate of Advanced Study in Administration. She taught for a year in Hinckley-Big Rock, then stayed home to raise children and started a small business called Kreative Keyboards. When she returned to the workforce she taught technology at Clinton Rosette Middle School in DeKalb. Mrs. Hill moved on to Genoa-Kingston where she taught 5th grade, served as curriculum director, and is now the principal of Kingston Elementary School. She serves in her community on the Genoa-Kingston Education Foundation, the Goodfellows, and 4-H. Learn more about the Excellence in Education Awards. 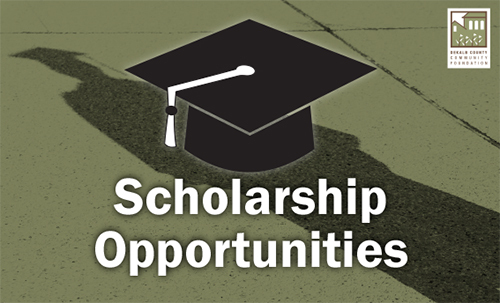 For questions, please contact Community Foundation Grants Manager Becky Zantout at becky@dekalbccf.org or 815-748-5383. See all the photos from the awards reception!